The origin of the documents, which are presented in this museum dates back to the French officers‘ captivity by the Germans, following the defeat of the French army in 1940. Most of them spent several years in officers’ camps, called the “Offizer-lager” or OFLAG. A lot of OFLAG got hurriedly installed by the Germans, sometimes in existing buildings all over the regions of the “Reich”, including at this time Poland, Czechoslovakia and Austria. In 1945, only 15 OFLAG still remained. Under the Geneva convention, the officers were not obliged to work. Confined for years in a narrow space, without any privacy, they had to draw upon themselves to find the sufficient resources to overcome with dignity, the ordeal of being captive and separated from their families. They had no information about the duration of their imprisonment. However, they were able to find the resources to overcome their ordeal by maintaining their solidarity. They remained unfailingly united, stimulated by their resistance to the nazi and Vichy propagandas which were imposed upon them. This solidarity would assert itself in the forms of culture, art, and spirituality, thanks to the contribution of some exceptional men who shared their lot. 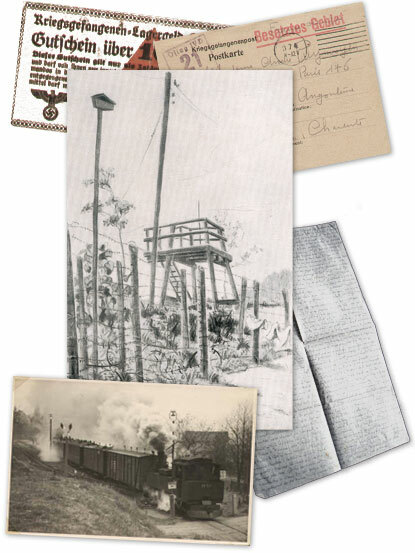 All these archives have come from family collections which were freely confided to the association “Mémoire et Avenir – Chapelle française de Soest”, in order to share with you the memories of thousands of officers and to transmit them to future generations. These archives, which until the present often stayed unexploited and buried, now have the chance to be brought to light. We hope they will arouse the interest of a large number of people. It is the first time that such a collection of memories has been compiled and exposed, allowing us to study the recollections of the captive officers of the OFLAG which was almost never done as such. The benefactors who have confided these archives to us – and they are warmly thanked for that – have authorized the association to reproduce them in this virtual museum. If some families recognize themselves as inheritors of these documents, we ask them to understand our difficulties in finding them and we ask them to contact us. Visitors to our website can pass their family archives on to us. Don’t hesitate to contact us - the vocation of this museum is to continue to be enriched day after day.